Taking notes during classes, lectures and conferences help you stay focused and assimilate information. Writing your ideas can also help you organize your thoughts, which is helpful when working on a paper or a project. I use notebooks and my iPad to take notes and create illustrations to document my thought process. Although many applications and other software are available for Google chrome, iPad, computers, other tablets and smartphones, in many cases for free, the majority of them simply don’t cut it. Over the past year I have tested quite a few and have identified 3 that I think are pretty great. They are free, but one requires in app-purchases. This app is one of my favorites. The image above was created with it. I like its simple yet effective layout: ideas are organized in notebooks you can customize (cover image and title). Pages can be switched from one notebook to another. In-app purchases are required, but you can buy all pens and brushes for about 8$ if I am not mistaken. The color palettes and the color customization tool is 2$ extra. I really don’t regret that purchase, and I normally never pay for apps. I use this app to draw my ideas and share them with others. I make lists in my notebooks or take notes. A lot of the planning for my blog is done using Paper 53. I only wish I could insert text and images. Then the app would be perfect. Although I have to admit I would prefer the good old undo/redo system to the rewind option. It causes be trouble sometimes. 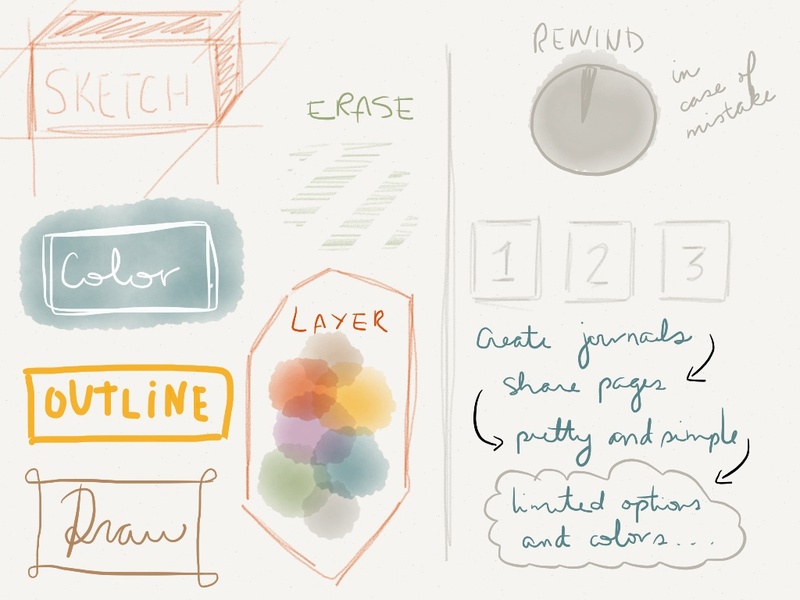 As its name indicates, this app is useful to draw ideas and brainstorm with colleagues. You can add text on post-its (6 colors available), draw (8 colors) and erase. The final product can be saved to photos or shared by email and modified by colleagues. The app offers limited possibilities, but does allow to zoom in and out, which helps a lot when you are trying to write in small letters. I just recently discovered this app and find it offers everything Paper 53 doesn’t: image insertion and modification, ruled or squares pages for the handwriting impaired (me), undo/redo and more. Too bad it bugs. A lot. Paint, highlight, insert and cut images, erase and write, either with a pen or a pencil. If you can’t hand write so well, insert text and select the font of your liking. Zoom in and out. Share the product through email, Facebook, Evernote or Twitter. Two things annoy me with this app: whenever I zoom in, the pages flip. Also, the limit for images in a page is pretty low. Apart from that, I think this app is pretty sweet and could become part of my working process. Have fun getting some work done! Great post! I always enjoy productivity tips (that’s why I am addicted to Lifehacker). I don’t have a tablet but I did use to write my notes on my smartphone. Liked it at first but I am really just addicted to paper. I think any paid app for taking notes is much more inexpensive compared to the number of notepads, notebook/journal I have bought in the past. For that alone, I wouldn’t mind trying them out. Thanks! I know there are some apps for smartphones that could suit your needs. Personally, I use my phone the lazy way: I record classes and conferences and then take notes on the computer or ipad. That saves me from being the noisy person typing too, whenever I don’t have my iPad. Great, great post..! And informative. Which I guess is what makes it great, right? Thanks! I had fun making the images.